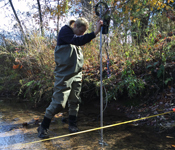 Maryland Department of Natural Resources has been monitoring water quality at Deep Creek Lake since 2009. The interactive map below displays long term mainstem and cove stations in Deep Creek Lake where we have collected water quality data since the program's inception in 2009. Below the map you will also find links to background information, water quality data downloads, reports, and newsletters. Explore the Deep Creek Station Map! Water quality profiles and water samples collected at 4 mainstem lake stations from 2009-present, during select months (March/April, May, June, July, August, September, November/December). Water quality profiles collected at 7-10 lake embayment stations near-monthly from 2009-present. These shallower areas represent the nearshore environment where most water quality concerns are found. 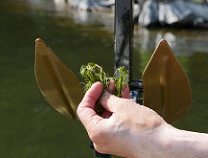 Beginning in 1980, monthly 'base flow' samples, as well as storm event samples, have been collected from the Cherry Creek site to determine nutrient and sediment loadings. 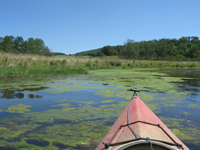 The types, distribution, and abundance of aquatic vegetation types have been surveyed at various locations within Deep Creek Lake since 2010. This comprehensive report covers water quality trends at Deep Creek Lake stations from 2009 through 2016. * You can also search Eyes on the Bay's publications database, just choose 'Deep Creek Lake' as your 'Region' of interest. 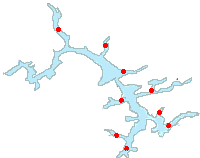 Deep Creek Lake is the largest reservoir completely within the Maryland's boundaries. Like all Maryland lakes, Deep Creek Lake is manmade, and was created in 1925 by impounding Deep Creek with an earthen dam to provide a water source for a nearby hydroelectric generating station on the banks of the Youghiogheny River. Download Deep Creek Lake water quality data as a .csv file from Deep Creek Lake for your desired station(s), parameters, and date range using our data query tool on our Deep Creek Lake Data Downloads page. 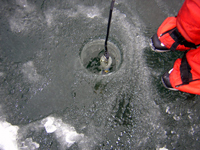 Data for other Deep Creek Lake monitoring programs and stations will be added soon.